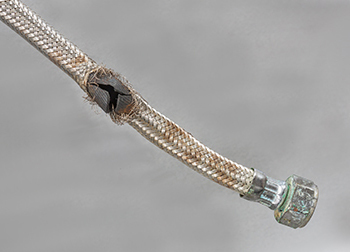 Water supply hoses that are constructed of austenitic stainless steel braid reinforcement can rupture under normal water pressure due to pitting corrosion and SCC of the wires. 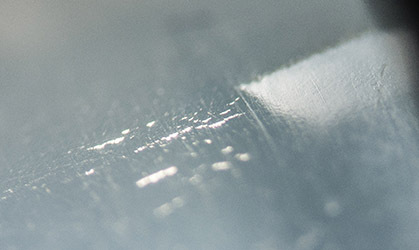 Chlorides derived from ordinary chlorine-containing household products are the source for corrosion attack. 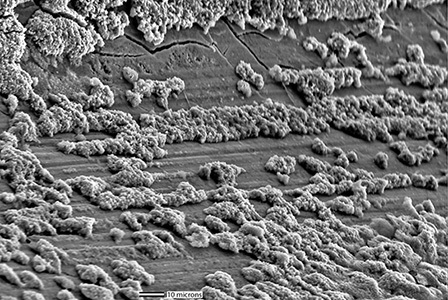 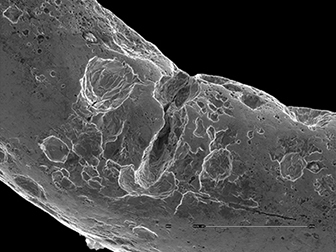 The SEM view below shows zinc-rich globules on the surface of the thread, and underlying SCC cracks. 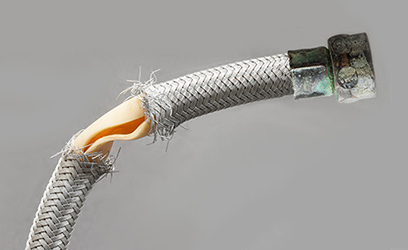 Dezincification is often a precursor to SCC. 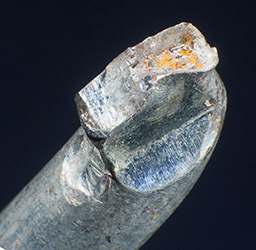 Dezincification is selective leaching of zinc from brass. 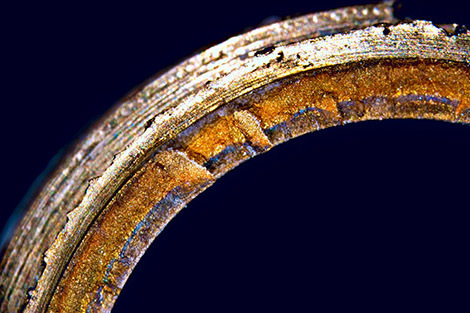 As zinc leaves the brass, a layer of porous copper remains. 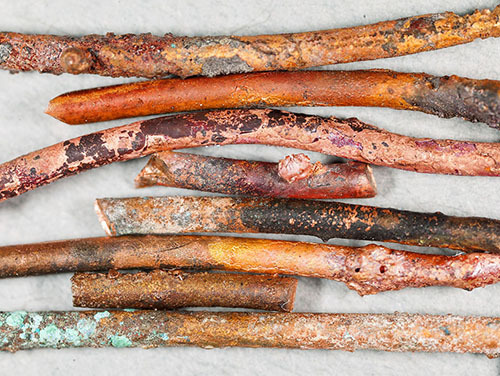 Copper conductors exposed to fire exhibit distinct features that can be useful in investigation of cause and origin. 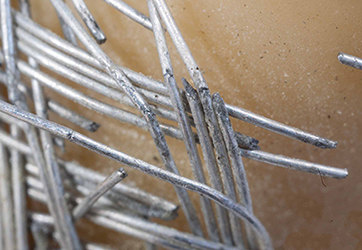 Below are wires recovered from the same fire scene. 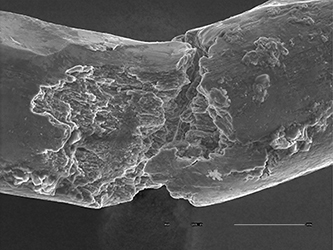 They have a wide array of physical features. 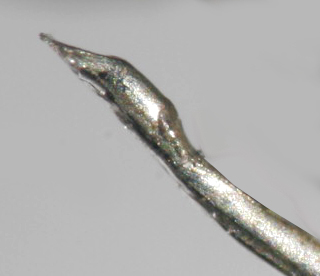 At right is an arc bead on the severed end of a stranded conductor. 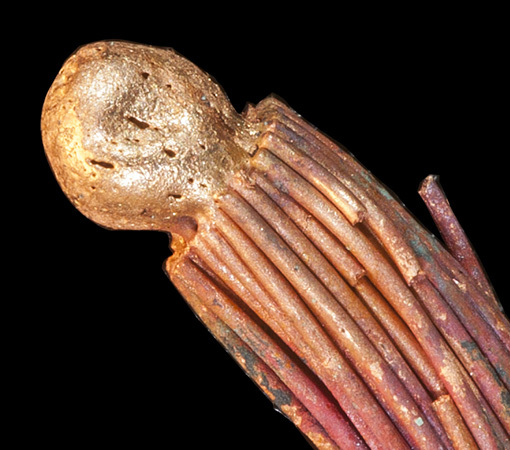 Arc beads are often attributed to the cause of a fire. 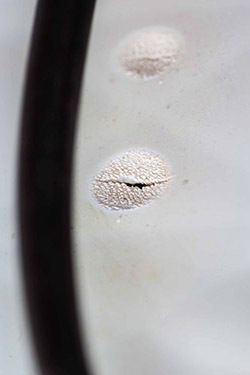 However, they indicate only that the conductor was energized at the time of severing. 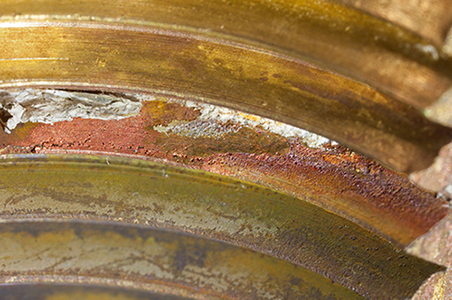 SCC is a corrosion mechanism wherein a susceptible metal forms brittle cracks in the presence of corrosion and tensile stress. 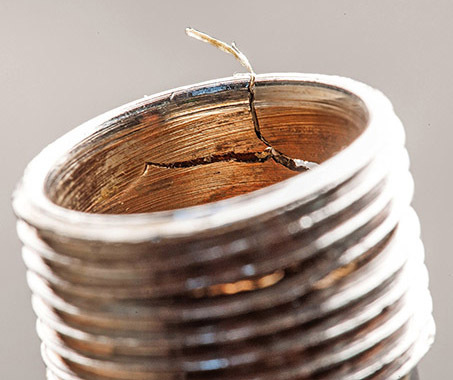 Failure to heat treat brass products for stress relief reduces SCC resistance. 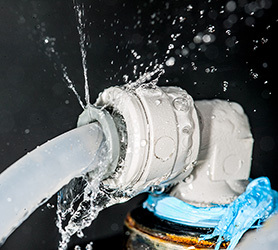 Leaks in a concrete slab were discovered shortly after installation of a radiant heating system. 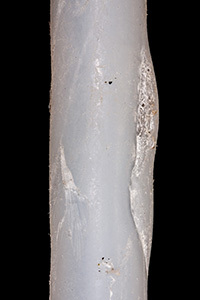 Water had been leaking through blisters in the PEX tubes. 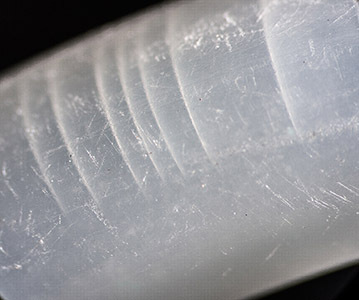 The blisters likely formed when the tube was still soft during extrusion. 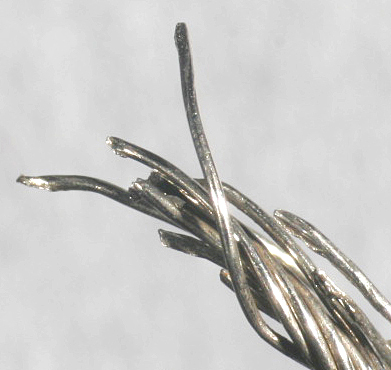 The wire rope loop had been connected to an anti-two block device on a crane. 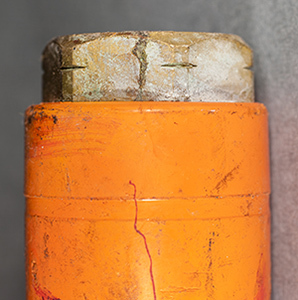 This device prevents the "headache ball" from contacting the sheave, which can cause the line to break and potentially cause injury to those below. 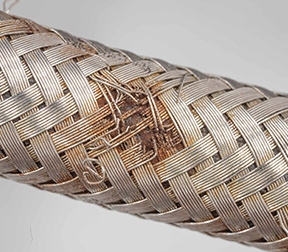 The rope was weakened due to abrasive wear of the wires, ultimately leading to its failurein tension. 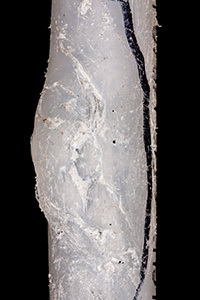 Water leaked from a fissure in a PE tube at its connection to a water filter. 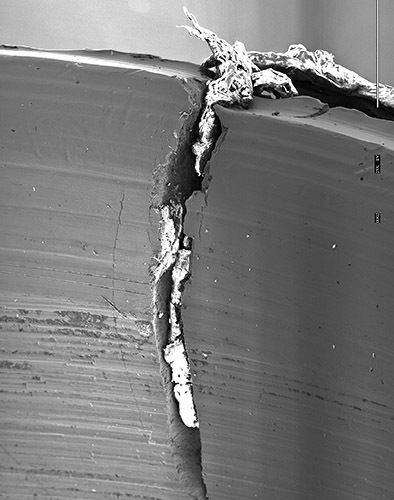 The fissure (cloudy patch) was intially a subsurface flaw. 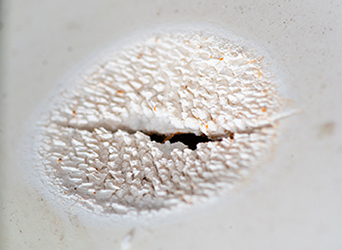 Finer flaws can be seen trailing the fissure. 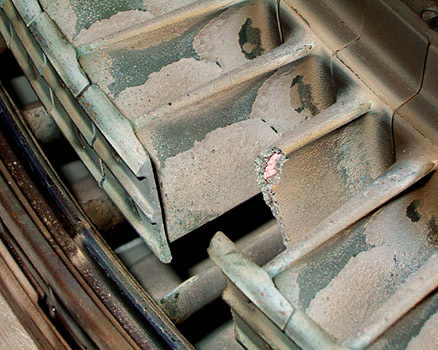 Residual mold material in the cooling passage of this turbine blade caused it to overheat and fail in creep. 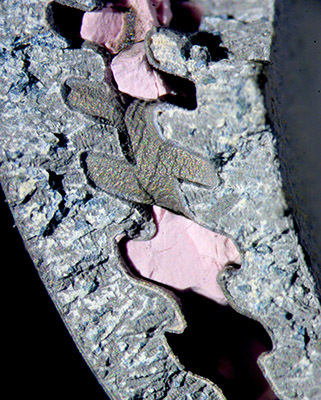 The mold material appears pink. 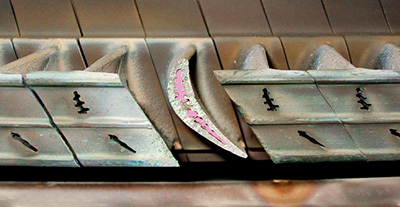 This is from an industrial gas turbine engine used in remote power generation. 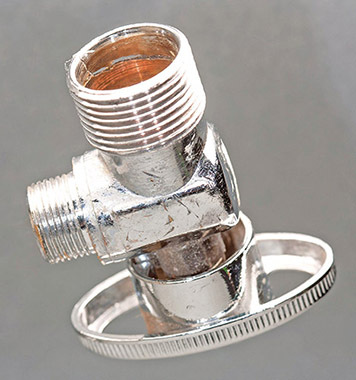 Plastic quick-connect fittings such as these are susceptible to delayed failure at normal water pressure if their design incorportates sharp corners and thin wall thickness in critical areas. 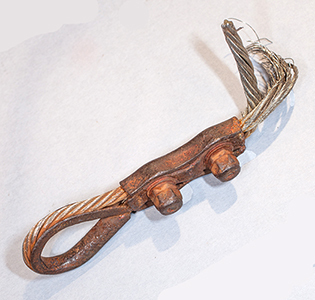 The clip mechanism of this carabiner, which had been used on a saftey harness, separated from the loop due to overload. 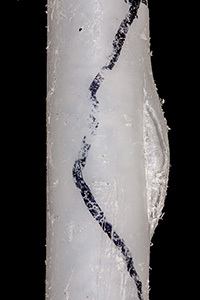 The fracture displays the characteristic cup-and-cone morphology of a ductile fracture. 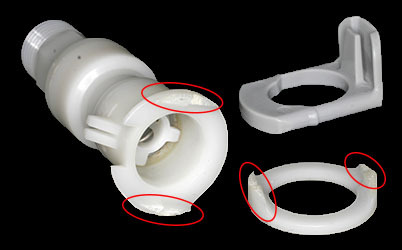 Plastic toilet connector nuts often fail due to a design which incorporates sharp interior corners where stresses are concentrated. 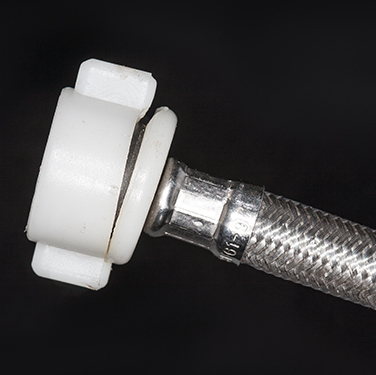 Like stainless steel braid, exposed aluminum braid is unsuitable for use in bathrooms where chlorine-containing cleaning products are used. 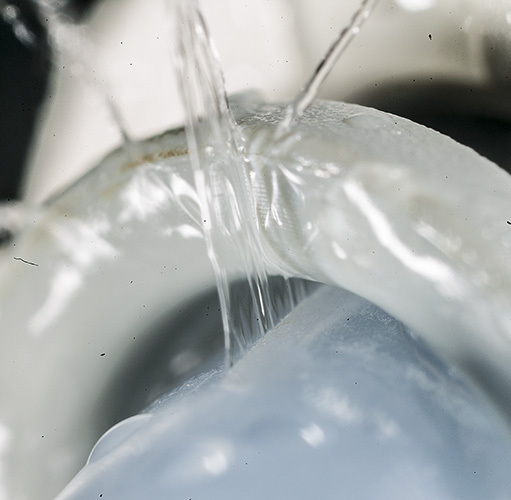 High-zinc brasses can be susceptible to SCC in water service, and especially so if manufacturing stresses are not relieved by heat treatment. 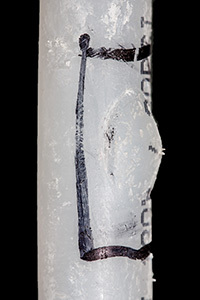 Subsurface flaws in PE tubes can grow under normal water pressure, eventually penetrating the tube wall with subsequent leaking. 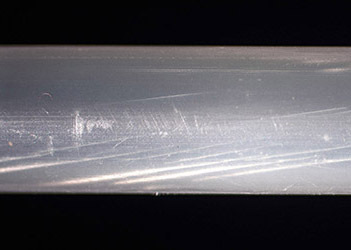 The flaws in these tubes appear cloudy-white. 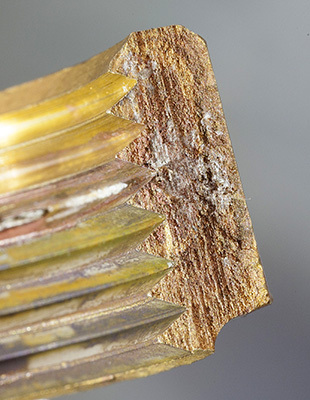 The brittle nature of this fracture indicates that the brass possessed inadequate ductility, most likely resulting from fabrication. 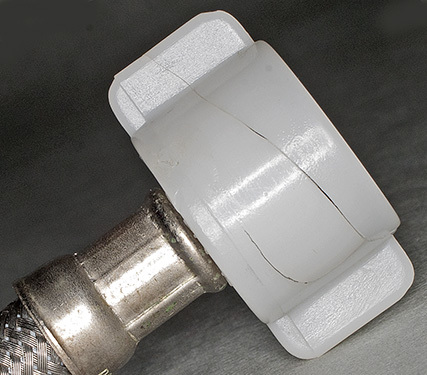 Plumber's tape lodged in the crack, possibly indicates that the crack was present prior to tightening. 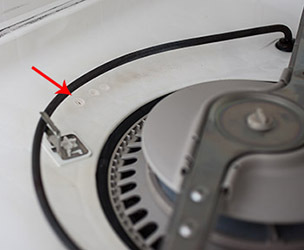 Small patches of degraded plastic at the base of a dishwasher tub, directly below the heating element, caused slow leaks. 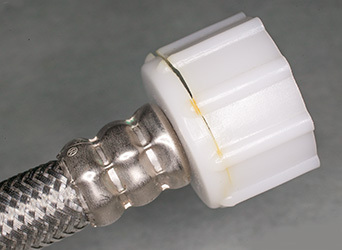 Degradation was caused by long-term, localized heat exposure from the heating element.